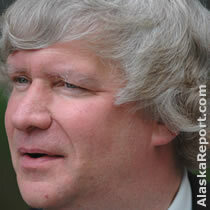 Former Alaska lawmaker Vic Kohring was sentenced Thursday to 3 ½ years in prison for his part in a bribery scheme involving former VECO owner Bill Allen. Kohring blames his convictions on federal prosecutors who he claims twisted his words and by a judge with a severe conflict of interest. "I refuse to cower before you in hopes of receiving a lighter sentence," he told U.S. District Court Judge John Sedwick. Kohring's lawyer said "He's Andy Griffith, he really is." Prosecutor Joseph Bottini replied "I don't remember any episode of that show where Andy Griffith took cash from anybody." Vic Kohring "My conscience is clear. I did nothing criminal. I was a little naive, I'll admit that." "I refuse to cower before you in hopes of receiving a lighter sentence," Kohring told U.S. District Court Judge John Sedwick.